Parking: On the street and in nearby lots. The journey begins before you enter this small, former train depot just off downtown Decatur. Go up the steps and you’ll find a little island plateau surrounded by landscaped greenery and an expansive patio. Opening the big wooden door, you’re instantly enveloped by the raucous hubbub inside – big laughing, loud talking, the plaintive Americana soundtrack – but most of all, the chicka … chicka … chicka … chickachickachickachicka of what first sounds like a locomotive pulling away, but is in fact the real steel engine of this enterprise: a stainless cocktail shaker. You’ll have to go very early, soon after the 5 p.m. opening, or very late (until 1 a.m. weekdays and 2 a.m. weekends) to avoid a wait at the Kimball House, which does not accept reservations. Plan especially carefully during this holiday season, when the Kimball House will be an ideal spot for a dinner that can be either a big splurge or an intimate little party. It’s hard to believe this place was once a snake-bit restaurant gulch, where it seemed one eatery after another ran off the rails. But the Kimball House, a venture from the folks behind Decatur’s The Brick Store Pub and Leon’s Full Service, seems to have gotten right what the others missed – starting with the details in this c. 1892 structure. Check out the raw brick and high-backed leather booths, belt-driven ceiling fans, books and curios installed in the display cases above the booths, huge windows pouring in sunlight or the lights from cars and trains passing by at night. Despite its small size, the Kimball House seizes its inspiration from one of Atlanta’s first grand hotels, which contained one of its first grand restaurants, specializing in oysters and caviar. The original Kimball House, near Five Points, had hundreds of rooms and uniformed, gloved staff before it was razed for a parking deck. This much-smaller Kimball House pays homage to what went before, not only with its carefully chosen ingredients and full oyster and caviar service, but also its well-trained staff, who seem to be genuinely excited about the restaurant’s mission and want to share it. The oysters-and-cocktails formula (bonus for chargrilled octopus, as well as the latest craze: absinthe) is a popular one right now, but the Kimball House does it better than anyone else in town. Somehow, the Kimball House is both a fun bar and a great restaurant. If you want to sip one of the Kimball House’s cocktails, try the Good Old Boy: Peanut-infused J.W. Dant bonded bourbon, lemon and sea salt, with a naturally smoky flavor that our waiter says was accomplished with something called “a smoking gun.” (Do Woodward and Bernstein know about this?) Subtle, simultaneously brand-new and totally familiar, the drink encapsulates everything that works well about the Kimball House. It’s also a lot of fun to order the caviar service, a splurge that varies in price with the type you choose, from $20 for salmon roe to $80 for white sturgeon, giaveri or baerii. We chose UGA’s farmed sturgeon caviar, among the world’s first sustainable sturgeon caviar, also $80. The service is delivered on a beaded silver-plate platter. (Like the rest of the tableware and glasses, you could imagine it in use on a Pullman dining car.) Small white ramekins hold finely chopped shallot and egg; other small plates offer fresh herbs, crème fraîche, buttered and toasted brioche and little rectangles of “pommes macaire,” or mashed potatoes fried and baked to a crisp. Above it all, like a little offering on an altar, the small bowl of caviar sits in a silver chalice filled with ice, small horn spoon at the ready. Presentation is definitely part of the joy here. Oysters (offered only on the half-shell on our visits) range from briny West Coast specimens to bracing East Coast gems. The mignonette is served in an eyedropper for precision. Even if you’re not up for a celebration of some kind, the Kimball House can make an occasion of a couple of small plates. The lettuce wraps ($14) with a pile of crispy pulled pork, Romano beans, cucumber, onion, carrots, peanut sauce and “Vietnamese dressing” with a fish sauce tang, would make a good lunch or light supper on its own. A smoked duck leg conquers conflicting flavors (okra, tomato confit, beech mushrooms, farro, grilled radicchio, arugula, bacon and … pickled blueberry?) with ease. I wasn’t quite as excited about the grilled trout – beautiful as a Pollock painting in its splashes of vegetal color, but underwhelming in flavor – or the oddly gray-looking new potato salad with smoked catfish and crème fraîche. 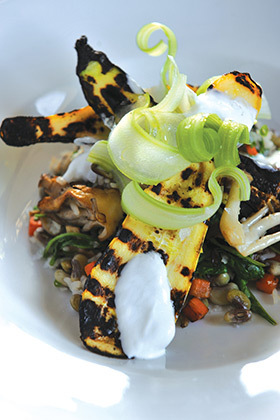 But man, the Hoppin’ John – topped with grilled squash and a tangle of thin-curled celery; the chicken liver pâté, with charred sourdough and a fruit-packed marmalade; that octopus; and an incredible brown-butter halibut. More, please. Desserts can be so subtle as to be more curious than deal-closing – more question marks than exclamation points. The figs and sable breton – interesting. The blueberry pie? That’s what I’m talking about. Better with the individually made and served drip coffee. Even with such a small menu, after three visits there is still a lot left to explore – it changes often, usually within certain themes (such as the Vietnamese-style salad, some sort of smoked duck, a variation on Hoppin’ John). I’ve also yet to try the house steak dinner – three courses for $45. I can’t wait to get back on board.